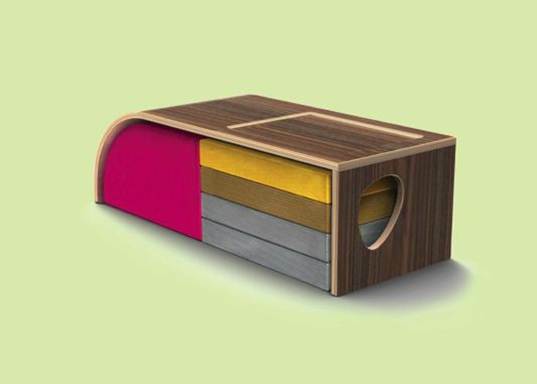 If you’re looking for a cool coffee table that’s not just adult design savvy but kid friendly, then the Iglooplay Tortoise Table is just the ticket. This elegant, but sturdy table is perfect for kids who just can’t help climbing and sliding. Beyond the functional table use, this table stores a Curved Pod and floor cushions neatly underneath for optimal kid playtime and casual seating options. The cushions are stitched for highly durable use and custom made to order for your decor palette in a wide variety of fabrics. You can even mix and match colors and textures if you like. This table and cushion set is made with wood and high density foam, upholstered with either 100% wool, eco textured vinyls or woven metallic polyurethane. Search for a retailer in your area that carries Iglooplay or contact Iglooplay for prices or to place an order at: [email protected], or call (718)622-0047. If you're looking for a cool coffee table that's not just adult design savvy but kid friendly, then the Iglooplay Tortoise Table is just the ticket. This elegant, but sturdy table is perfect for kids who just can't help climbing and sliding. Beyond the functional table use, this table stores a Curved Pod and floor cushions neatly underneath for optimal kid playtime and casual seating options. The cushions are stitched for highly durable use and custom made to order for your decor palette in a wide variety of fabrics. You can even mix and match colors and textures if you like. This table and cushion set is made with wood and high density foam, upholstered with either 100% wool, eco textured vinyls or woven metallic polyurethane. Search for a retailer in your area that carries Iglooplay or contact Iglooplay for prices or to place an order at: [email protected], or call (718)622-0047.